ultra violence – Film. Politics. Pop Culture. 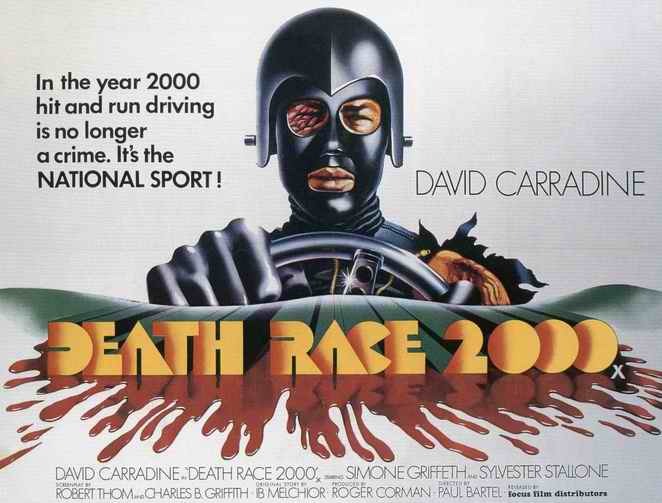 ‘Death Race 2000’ is a must have for the Corman-collector, a slick and violent game with death and mockery. It features the desired manly quo from actors David Carradine and Slyvester Stallone, with punky sidecar navigating sweethearts played by Simone Griffeth and Mary Woronov. The premise in no way stifles or outweighs the characters, as they all have their own motivations and psychological tendencies that ensue later. The premise of the movie doctrines Racers to garner points by driving through the city streets and highways and running over citizens with their alligator-jaw bumpers. The point-system gives the racer higher points for certain types of people, elder people being the highest amount of points possible, the second highest toddlers and babies. Frankenstein (David Carradine) is the notorious bad-boy of the race, masochistic and perverse in his grand theft killings. He must pair his jaded ways with his new navigator (Simone Griffeth), but little does he realize she too has a side-story of her own. Meanwhile, Machine Gun Joe (Stallone) remains the steady conniver against Frankenstein, his repeated one-upper, and turns maniacally set on wreaking him. The film is structured well, with equal moments of race-time and driver/navigator off-road relations or public relations. The moments of rendezvous at dinner and resting time makes the audience a truly third-person viewer, watching the racers social-gesture for tense, ready to burst moments. The film is a Corman-classic and demands a sense of pessimism from the starting-line; essentially, it is a fun romp through revolutionary-intrigue, character dynamics, and fast-paced, heavily-theoretical racing. But it is also a satire on what media shows and why they show it; for reasons we can’t seem to understand, but nevertheless like.